Our Blog Gymnastics vs. Dance - Which One is Better? Gymnastics vs. Dance – Which One is Better? 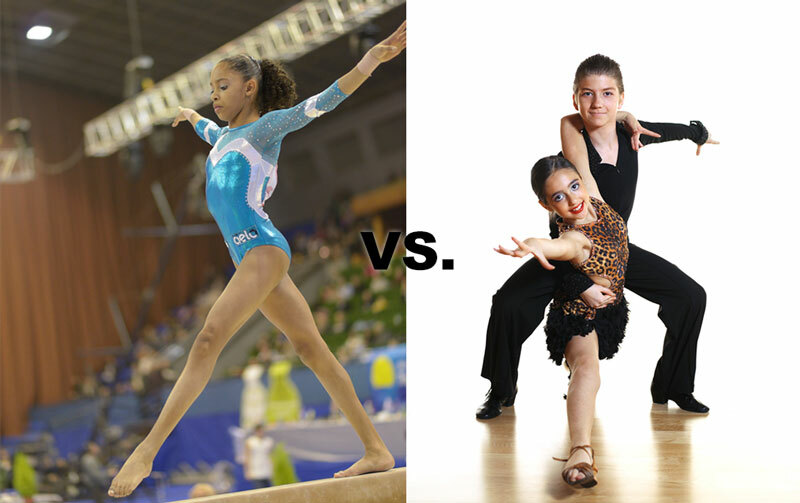 Dancing is a part of gymnastics and many dancers love to do gymnastics, so how do you determine which is better? Both gymnastics and dance have similar elements, but many people have a favorite between the two. If you are trying to decide whether to concentrate solely on dancing or gymnastics there are many things to consider to decide which is better. Many gymnasts will take a dance class to help with their dance moves on the floor, and dancers will take tumbling classes for the same reason. During these classes, some kids and teens will find out that their true passion lies in a different place than they first thought. On the other hand, a dancer or gymnast could take an alternative class that only fosters their passion for their favorite activity. For a gymnast or dancer to decide whether gymnastics or dance is better, they need to try both activities. When you hear or talk to talented gymnastics, you usually find out they started the sport when they were really young. In fact, the best gymnasts start at a young age, and older, beginning gymnasts have a harder time learning difficult skills simply because of their height. Dance, on the other hand, is a talent that can be discovered at any age. Kids as old as 16 or 17 can start dance classes and excel in them quickly. Gymnastics competition seasons are very long and gymnasts usually only move up one level a year, which can make it harder for older kids to compete in gymnastics for long periods of time, or move up to the challenging competitive levels. One of the great things about gymnastics tumbling is that it can easily be added to any dance routine. Leaps, jumps, pointed toes, and strength exercises are all things usually associated with gymnastics or dance. A choreographer can also add handstands, cartwheels, rolls, back handsprings, and other aerial tumbling passes to dance routines. However, stunts and tricks in a dance routine are not usually the primary focus of the routine. In gymnastics, the stunts and tricks are the heart of a routine and the dancing is just time filler between tumbling passes. Dancers and gymnasts can do many of the same stunts and tricks but are trained differently. Gymnasts for one usually have a strong side. For instance, they lead with their left leg during leaps or hurdles. Dancers, on the other hand, are trained to use both legs, which can make some dance routines difficult for a gymnast. For instance, if a gymnast is in a group routine, but usually leads with her left leg, it may be difficult for her to turn to the right in a dance routine. One of the reasons so many people like dance is because there are so many different styles to choose from. For instance, ballet is perfect for those that want a structured, controlled form of dance, and lyrical or contemporary dance focuses on emotion. Many gymnast moms will tell you that gymnastics is expensive, but competitive dance can be just as expensive or more expensive. Depending on how many classes a dancer needs the cost can add up quickly. Most dance studios require classes to be paid for separately, and each routine requires a different costume. Depending on the design of the costume, it can easily cost upwards of $80 to $400 and that’s before shoes. Gymnastics is expensive too. Most gym parents pay class fees, private lesson fees, and have to travel to competitions all over the country. Training leos can cost anywhere from $40 to $60 and competition leos can be upwards of $120, but most gymnasts only have one competition leo. When you see a gymnast stretching across the floor, you may think they would be a great dancer! The same goes for a dancer who can nail a back handspring on a gymnasium floor. But you might be surprised to find out that while dancers and gymnasts have a great deal in common, being good in one activity doesn’t guarantee you’ll be great in another. Gymnasts do a great deal more than tumble, and just because a dancer can tumble doesn’t mean they would be great on the balance beam, uneven bars, or vault. Many gymnasts also struggle with dancing. The floor routine is only 1 of 4 events that a gymnasts participates in during classes, practices, and competitions. In fact, some gymnasts do as little dance as possible in their routines because they aren’t strong dancers, but are amazing tumblers, but they can’t get their mind around the footsteps that are required to be a strong dancer. When it comes down to which is better – gymnastics or dancing, it’s a personal decision. Whether someone loves gymnastics or dancing depends on the talent and passion of the person choosing between the two. that did not help at all because i am a dancer and gymnast and i have to choose but i have 2 strong sides trained both ways and i know it is expensive and i know i want to do ballet and jazz styles. I am an old gymnast but I only did it for two and a half years. But I wasn’t able to get anywhere. So we switch he’d gyms but I was supposed to be on team and I didn’t. So I quit and went to dance. I was always a double sided gymnast which made my coaches mad. But doing day me is way better overall. Sure it requires alot of the same stuff dance will get u somewhere gymnastics won’t. Maddy you have to strong sides which is perfect. I highly recommend dance. You won’t break your back or anything for that matter as easily. It will be hard to say good bye but trust me you will be much happier. Both dance and gymnastics is very hard on your body. When I get home from dance I normally have to use heating pads and ice. When I get back from gymnastics, I normally am just able to deal with the pain. Even though dance hurts worst, I believe dance is better because you can express yourself. All the pain is worth it. Personally, I think both sports require much practice, blood, sweat, tears, and determination. But I do know that us dancers and gymnasts are some of THE BEST athletes of all time. Also, we can both agree that we are betta than CHEER!!! !